Steel IWC Big Ingenieur 7 Day Zinedine Zidane II Edition IW5005-08. Limited Edition of 500. Case diameter 45.5mm. Water resistant to 120 meters. Automatic IWC calibre 5113 movement, 42-jewels with 7-day power reserve. Brown dial with index hour markers and Arabic 10 o’clock numeral, 7 day power reserve indicator at 3. Date display at the 6 position. See through case back. Brown croc strap with steel buckle. Box and papers dated February 2013. Our reference S18501. SKU: 3023243. 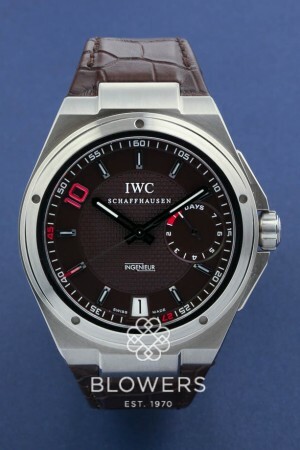 Categories: Aquatimer, IWC.